If your New Year’s resolutions included ‘consume more booze, but not alone’ this may be the mechanical friend for you, though be careful: he could well drink you under the table. 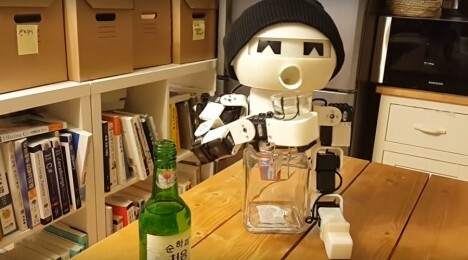 Developed by a South Korean inventor, Park Eun Chan, this may be the world’s first alcoholic robot. Named Robot Drinky, it acts as your companion while you toss back shots, beers or whatever you drink of choice may be. It will even clink glasses with you, aside from, of course, pouring liquids down its own artificial gullet. As a bonus: when you are all done for the night, your robo-friend’s glass stomach can be turned back into more drinks for you, or for him the next time ’round. See more in Robotics or under Technology. February, 2016.